When Stacey bought some hardy cactus from a place in Kansas back in the early 1990’s, I thought she was loony. Now, in 2010, we have all these wonderful varieties and are always looking for more unique ones. Many thanks to Don Campbell and our friends at the Chinle Cactus and Succulent Society. 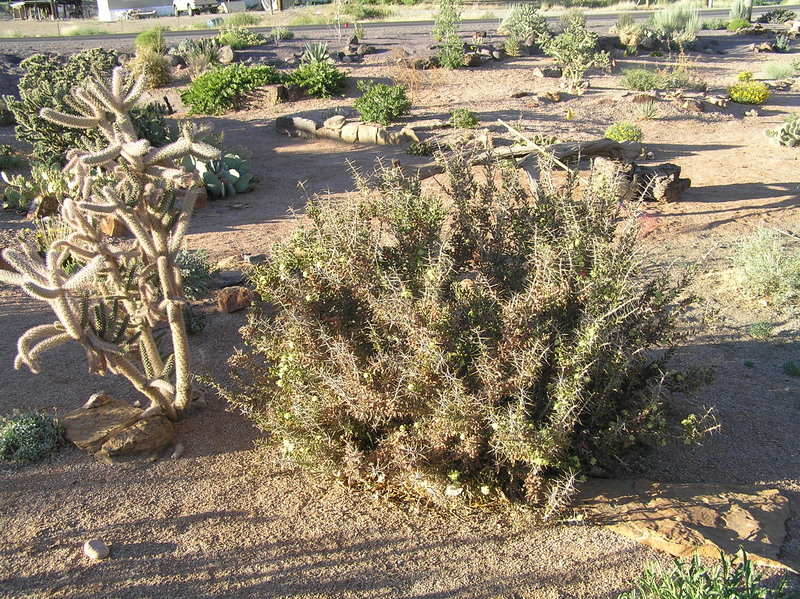 This is a large shrub like cactus with branches that resemble buck antlers. The flower color can vary; ours have a greenish yellow flower. 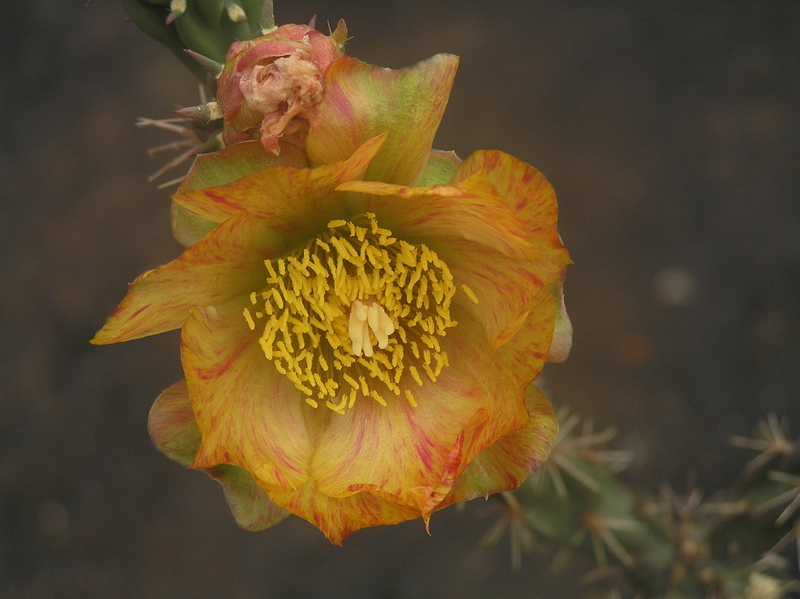 This is a tall shrub like cactus with yellow flowers streaked with reddish blush. This cholla was given to us by Jeff Brimley of Utah. 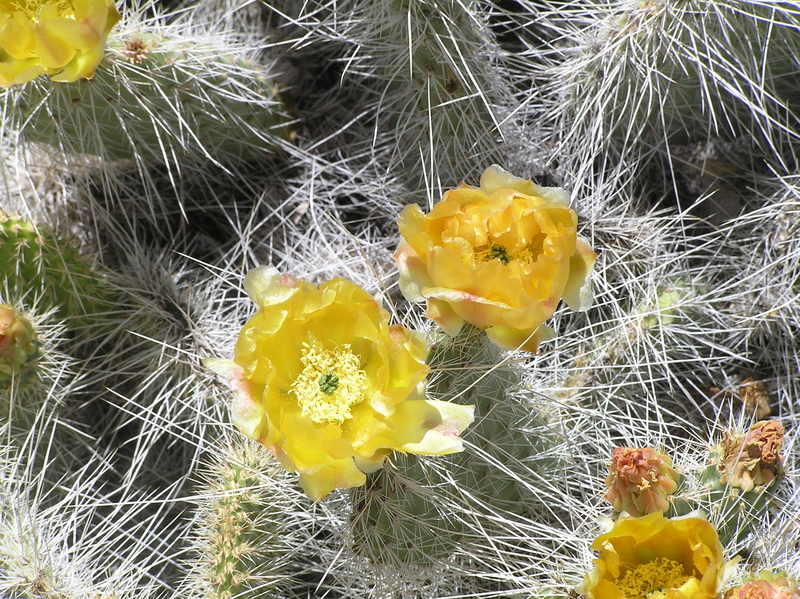 This is a tall shrub like cacti with long golden spines and greenish yellow flowers. The spines glow in the sun. 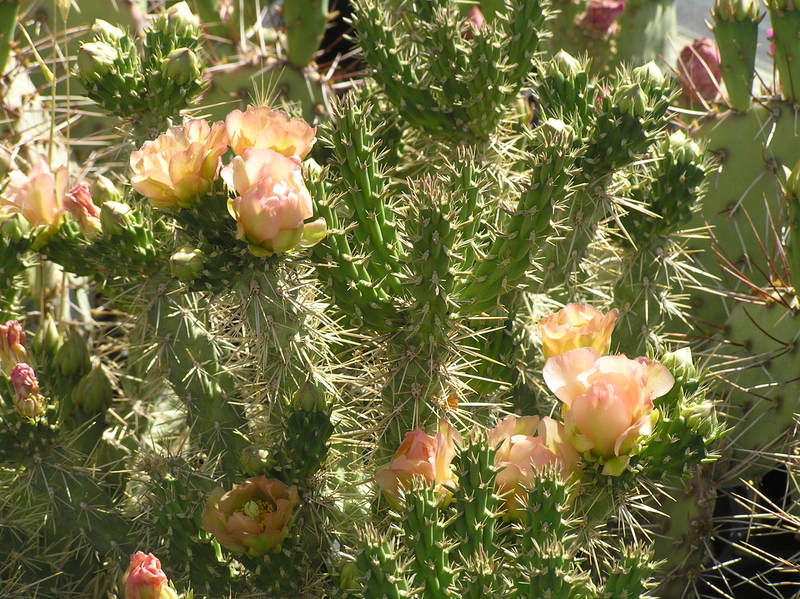 We think this cholla is a cross between C. davisii and C. kleiniae. 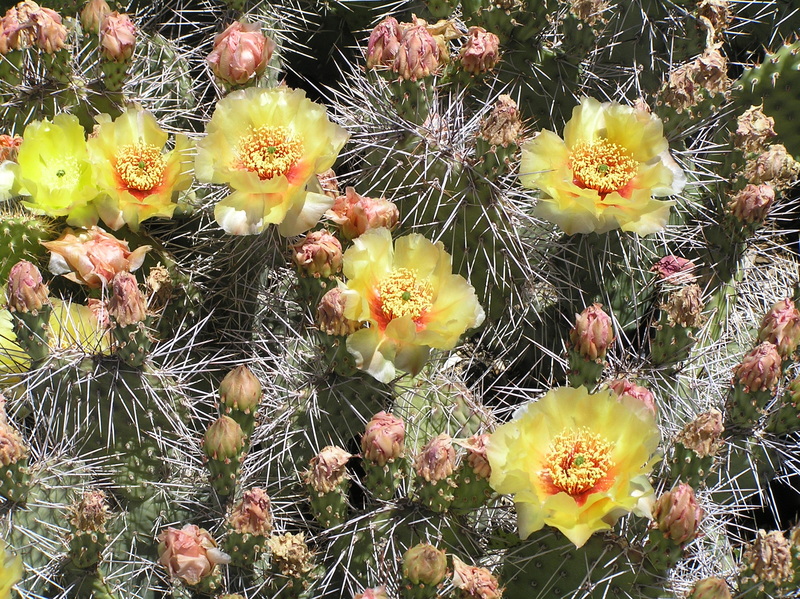 This hybrid has slender stems, gold spines, and a more upright habit than the Devil’s Cholla, yet it has the same yellow flowers. This is a tall shrub like cacti with light green stems in summer then turns purple in winter. The flowers are deep rose violet followed by large yellow fruits. 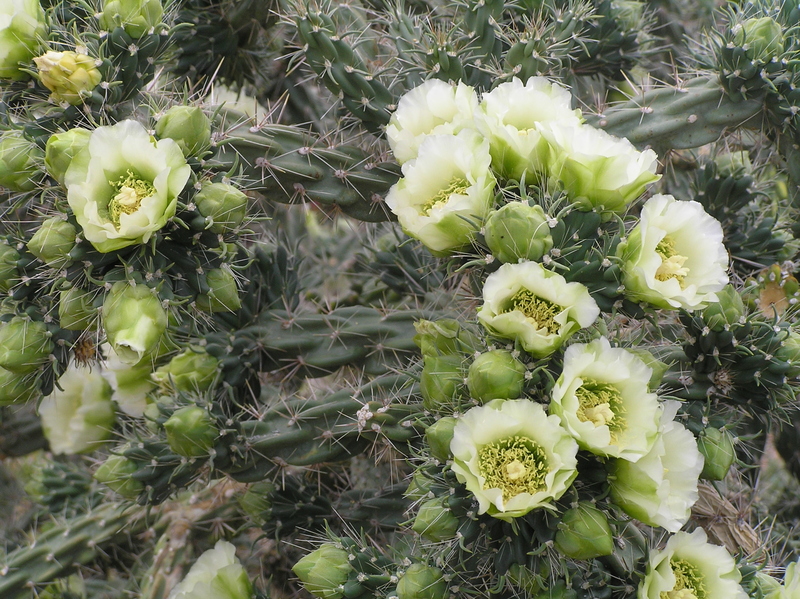 This is a tall shrub like cacti with deep green stems and white flowers in the spring. 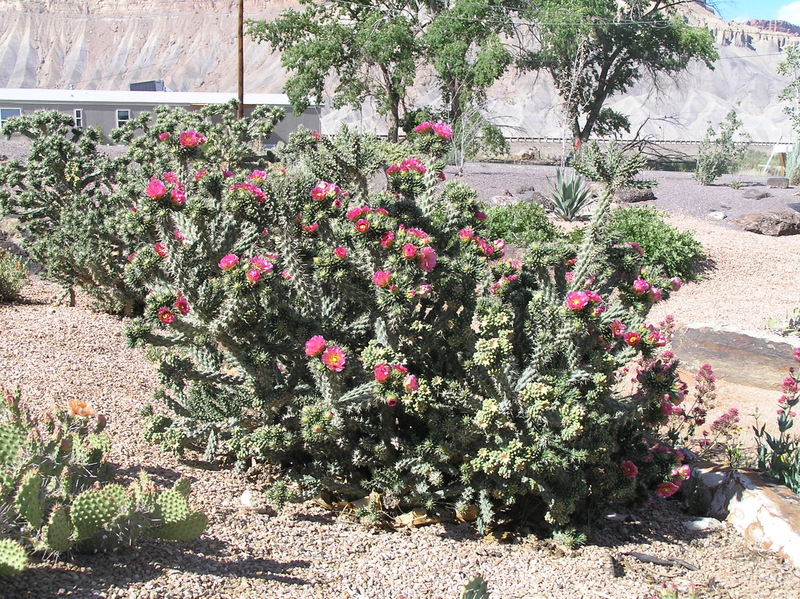 This is a medium sized shrub like cacti with bright pink flowers. Similar to the tree Cholla but not as tall. This is a very thick bushy cholla with very slender stems. Small yellow/green flowers give way to small fruits that become bright red like bulbs on a Christmas tree. 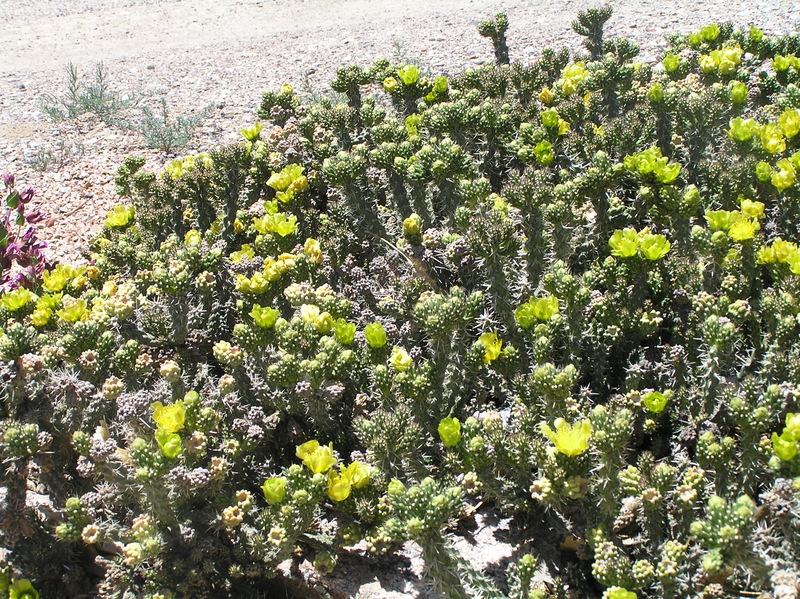 This is a slender shrub like cacti with pencil shaped light green stems. The flowers are pink to purple and the fruits are an orange color. 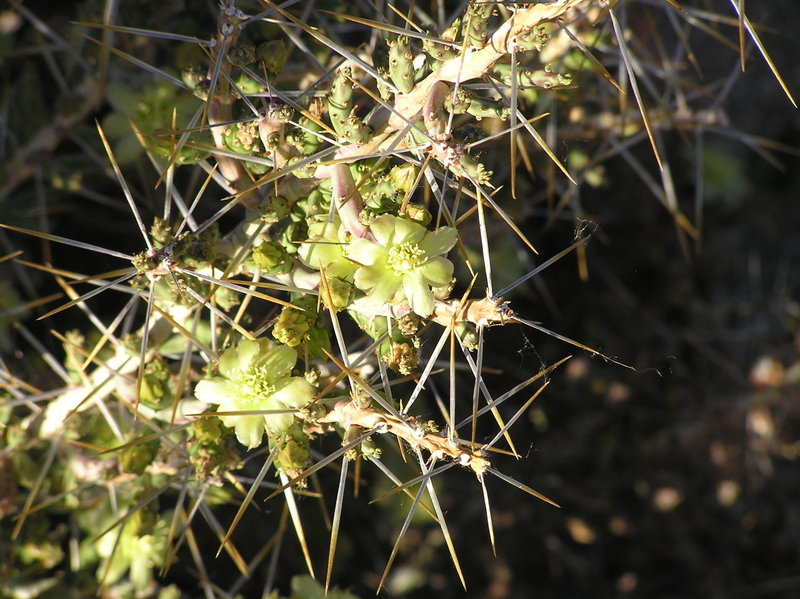 This is a heavily spined Cholla whose stems resemble a bottle brush. The maroon new growth fades to light green. The flowers are a dark reddish purple. 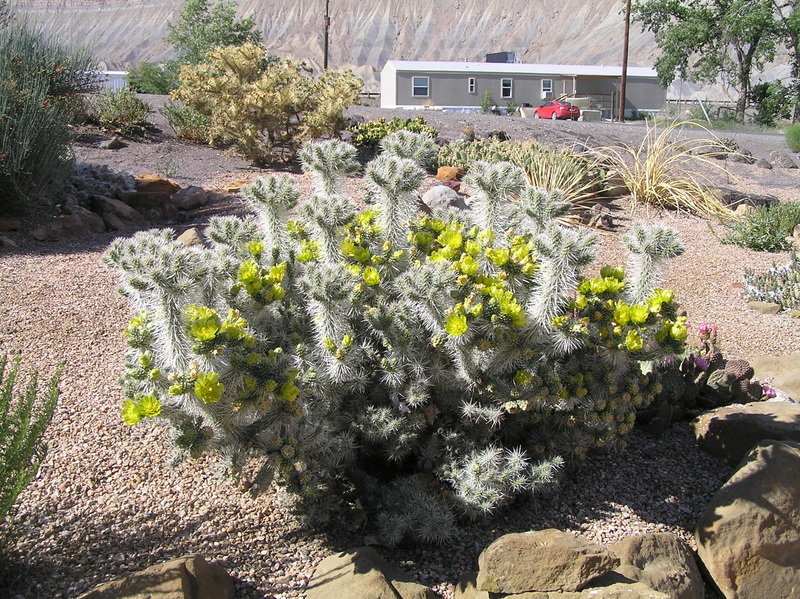 This is a medium sized cholla with pale green stems and greenish yellow flowers in spring. Medium sized Cholla with bright green stems and gold spines. Blooms bright yellow flowers in spring. This is a showy Cholla with striking silver spines that catch the sun light. 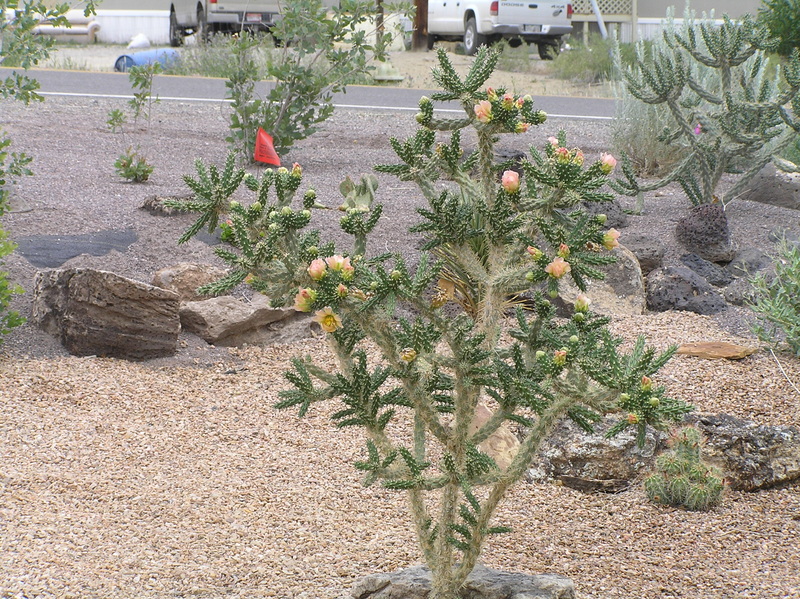 The combination of Silver Spined Cholla and Devil’s Cholla makes for great year-round interest. Almost indistinguishable from the Claret Cup, but a little more compact. 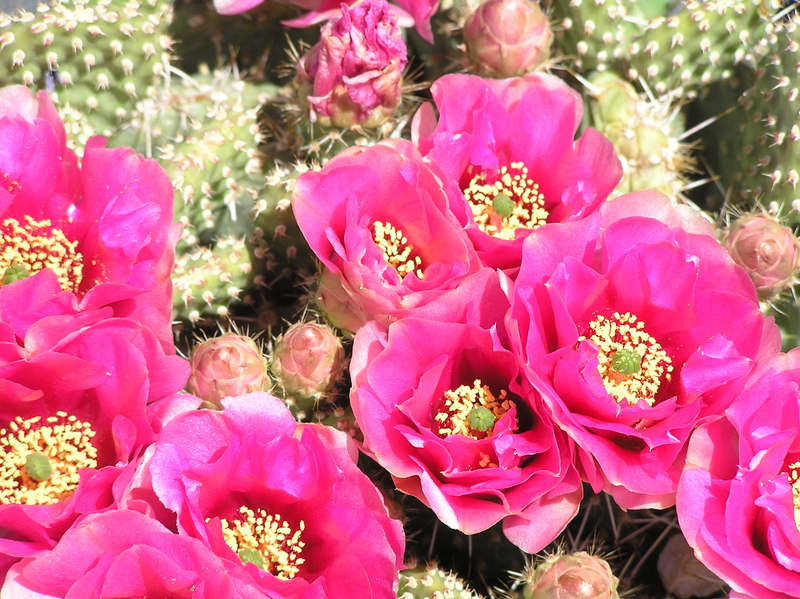 This is a clumping cactus with large red-magenta flowers. 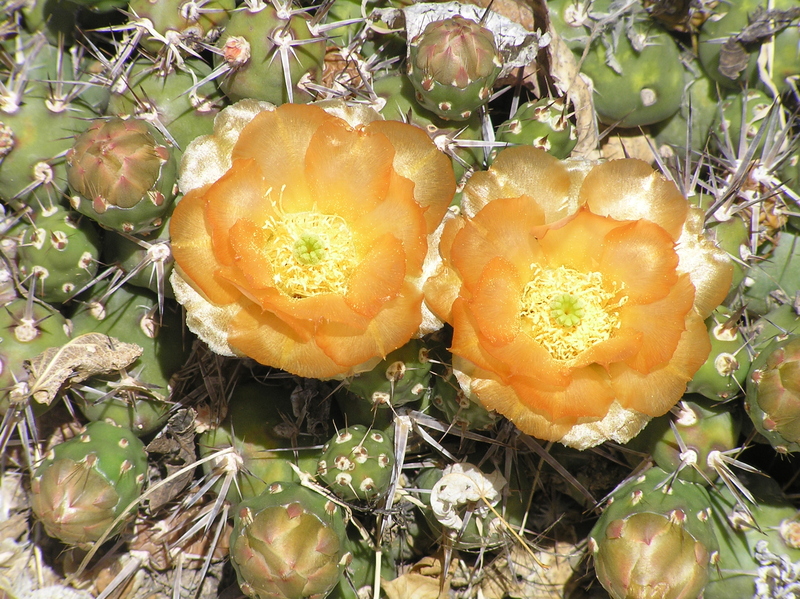 Originates in the Mojave Desert and Great Basin regions. This tends to be a more solitary barrel cactus, but does clump. It has large showy purple blossoms. This is a solitary barrel cactus. This is the most commonly found species of Hedgehogs. Forms large mounds of barrel shaped stems. In early summer they are covered with bright red flowers. The fruits are red, juicy and edible. This is a nearly spineless to spineless form of Claret Cup. Native to Western Colorado and Eastern Utah, they vary from having no spines to having many. 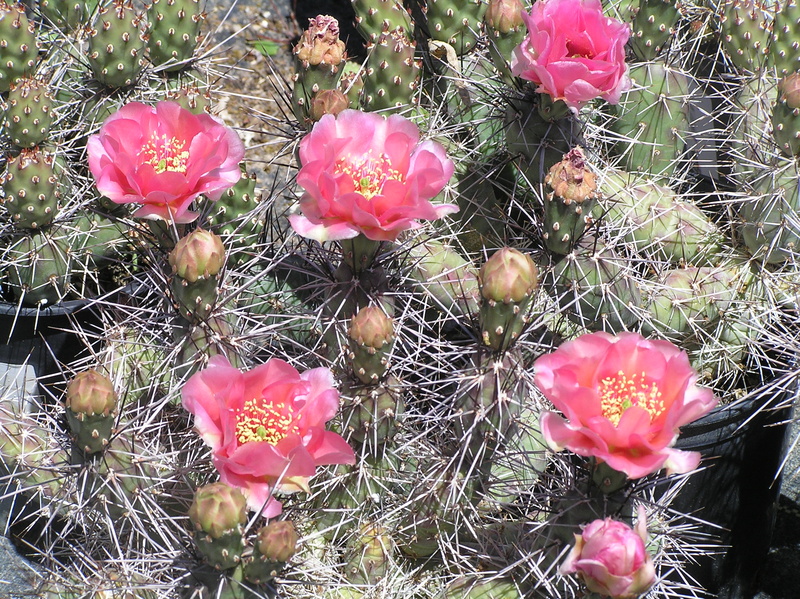 This cactus has stems 2″ wide by 3″ tall, either single or in clumps. 1″ yellow blossoms in May to June. 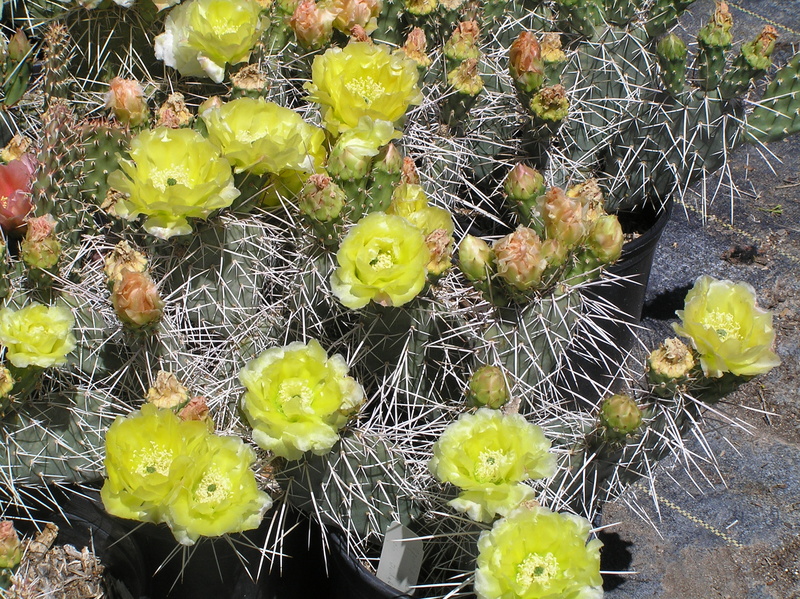 This cacti has 3″ by 3″ stems will be single or in small clumps. Having many pink 1″ flowers in spring. This is a low growing mat forming cacti with large club like pads. The pads have vivid white spines that are extremely wicked. This is a low growing mat forming cacti with club shaped stems. The young spines are various shades of pink, yellow or red. The mature spines are long white and dagger shaped capable of piercing leather boots. 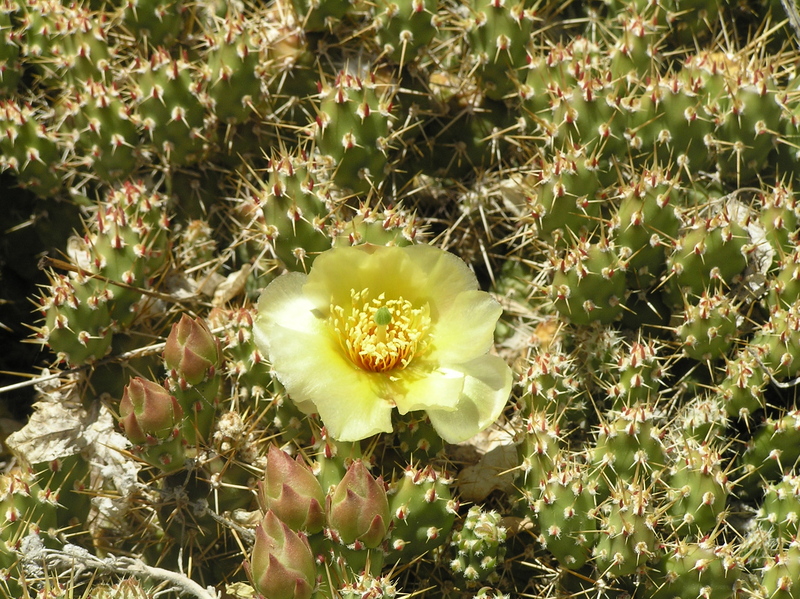 This small mounding cactus looks very similar to some Opuntia fragilis selections. It has the same tendency for the pads to break off easily. Originating in Patagonia, our stock came from one of our friends in the Chinle Cactus Club. This is a mound forming cacti with large beavertail shaped pad and large dark spines. They have yellow flowers in spring. This is a mound forming cacti with pads resembling beavertail cactus. While they appear spineless, the glochids can be very painful. 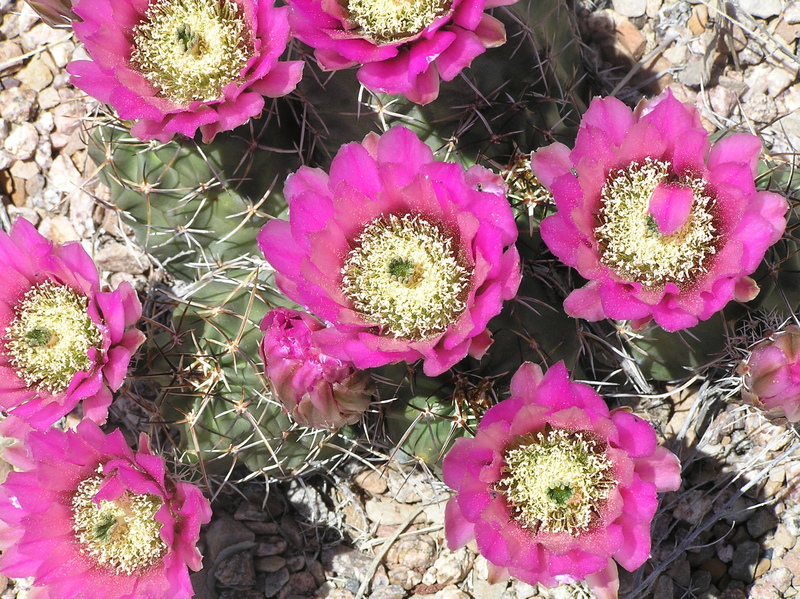 The purplish new pads along with the vibrant pink flowers make it one of the showiest cacti in bloom. The pads turn a deep purple in winter. We previously had this listed erroneously as a beavertail. 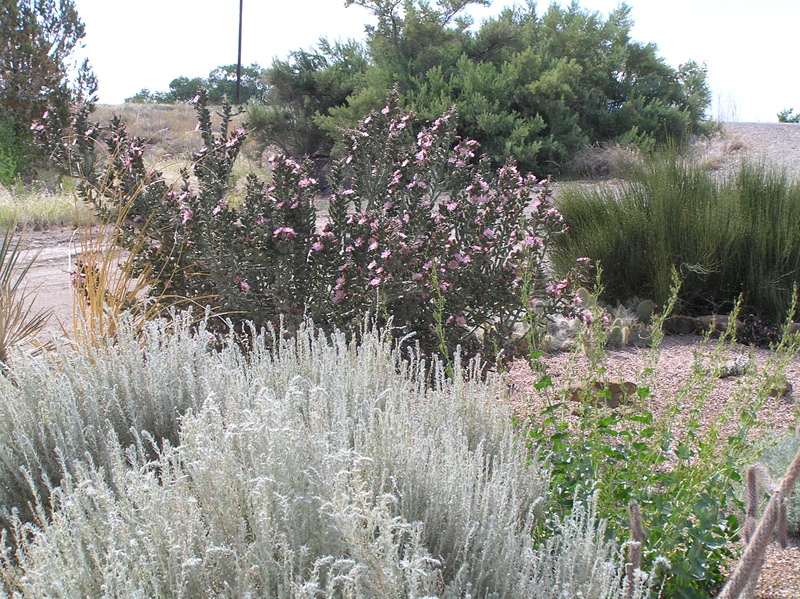 Native to Arizona, Southern Utah, and Nevada, it was selected by Art Coombe. 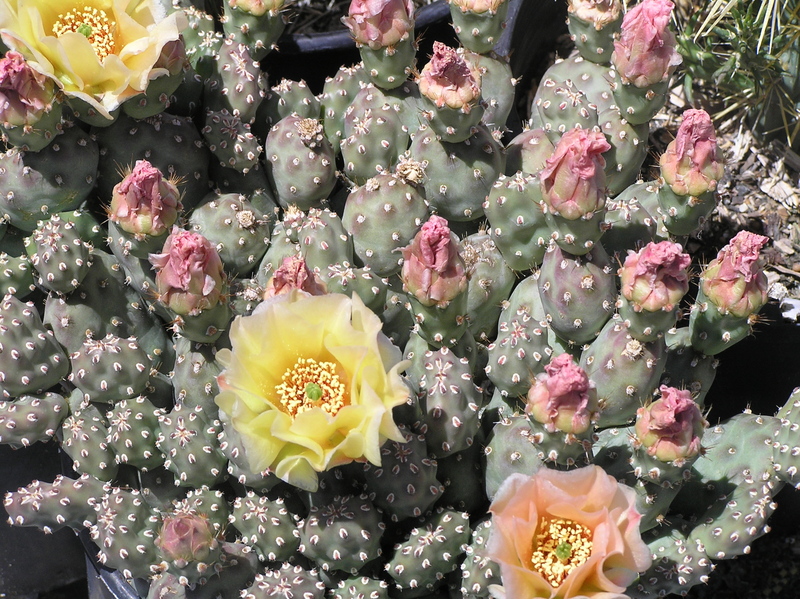 This is a mound forming cacti with large up to 12″ beavertail shaped pads. The flowers are a deep rose color. Plant in a protected area. The selection shown is from a more southerly source and is not as hardy as some of the smaller padded ones we grow. This is a low growing ground covering cactus with few spines. The pads resemble little potatoes. This is a low growing ground covering cacti with small rounded pads that crawl along the ground. 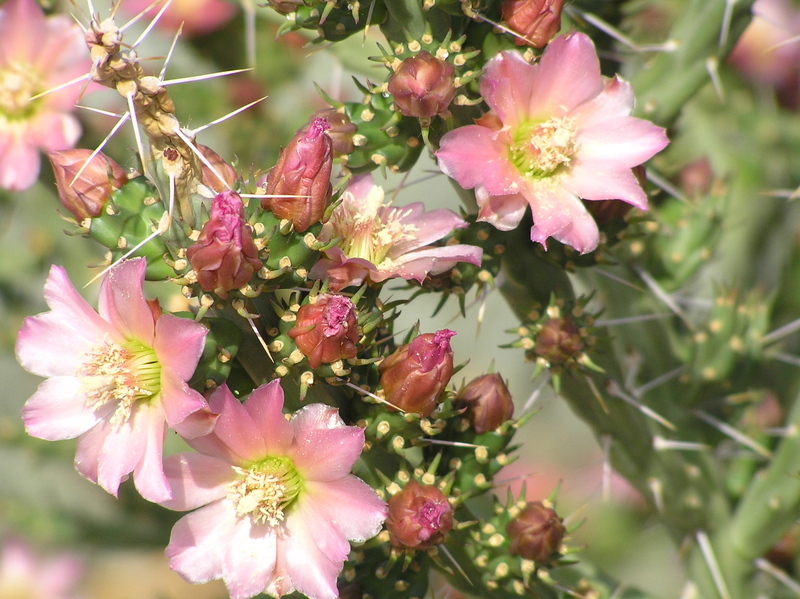 Flowers range from greenish yellow to pink, and spines can be almost nonexistent to as long as 2 inches. We have several forms available. 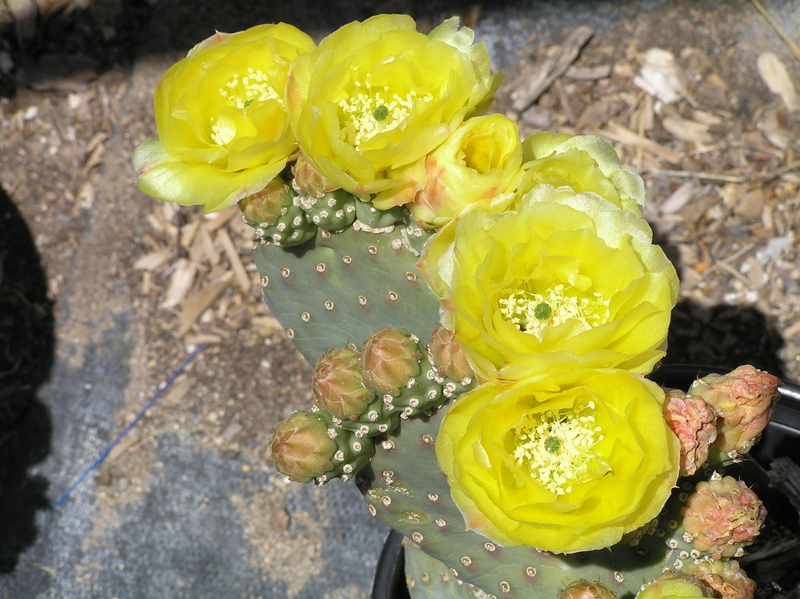 This is a low growing cacti with grey pads and yellow or pink flowers. 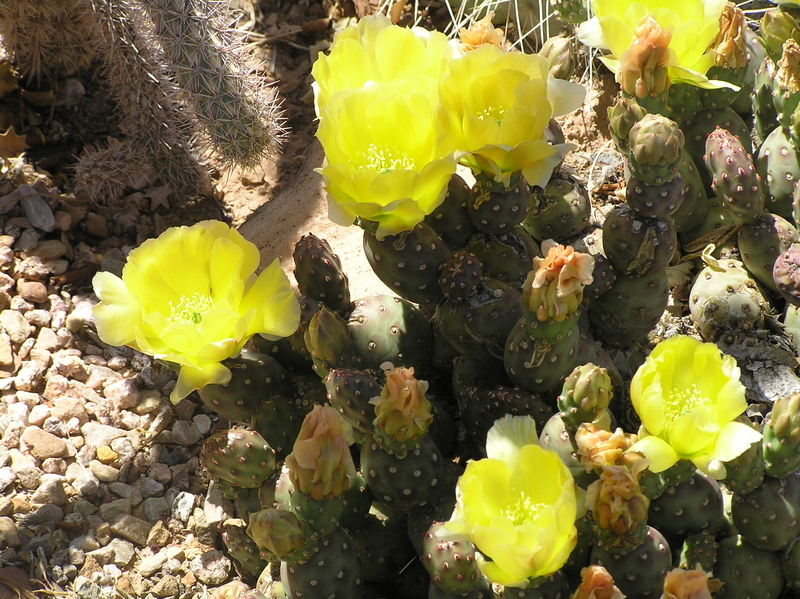 This is a low growing cacti with numerous tiny bright green pads with yellow flowers. This is a mound forming cacti with large bright green pads and very few spines. The flowers are bright yellow that blooms a little later than most varieties. They need protected area or a light cover to keep it looking good during winter. This is a large padded cactus with black spines and blue-green pads that turn purple during winter. The flowers are a nice yellow with a reddish-orange center. This is a mound forming cacti with large light green pads and few spines. The flowers are bright yellow to red, and then followed by red purple juicy fruits. We have selections in these different colors: Persimmon, Pink, Red, Yellow, and Watermelon. This is a mound forming ground cover cacti with large spiny pads which turn purple in winter. The flowers are yellow or pink. Fruits are tan, dry. This is a mound forming ground cover cacti with slender white spines. They have very showy, white flowers. 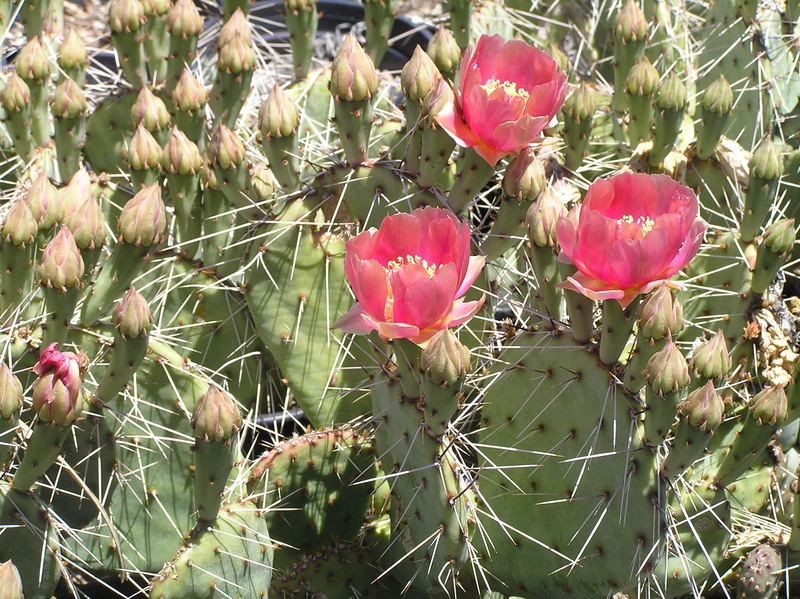 This is our own selection of the Plains Prickly Pear. Yellow flower buds open into a 2″ yellow flower with an orange center. The second day, the entire flower is orange, as more yellow ones are opening. 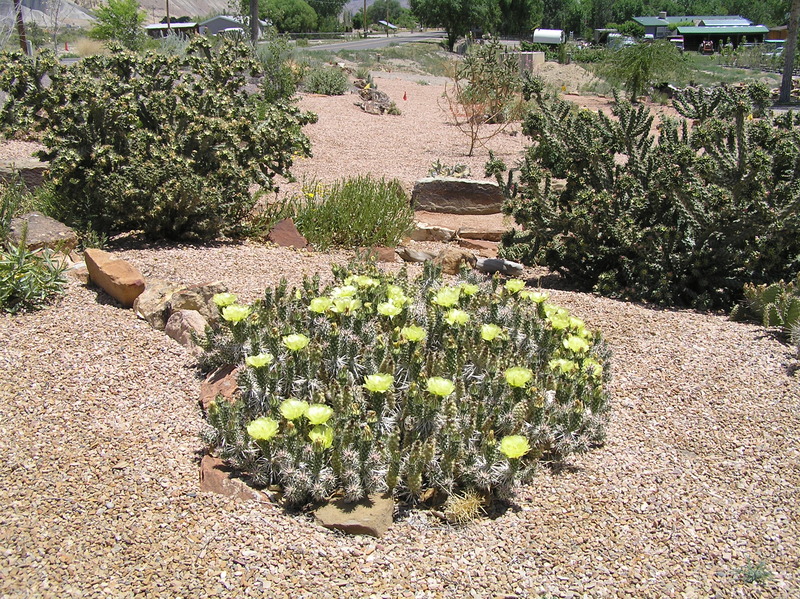 This is a heavily spinned mound forming cacti with bright yellow flowers. This is a dense mound forming cacti with circular pads only 1 to 2 inches across. They have beautiful pink flowers. 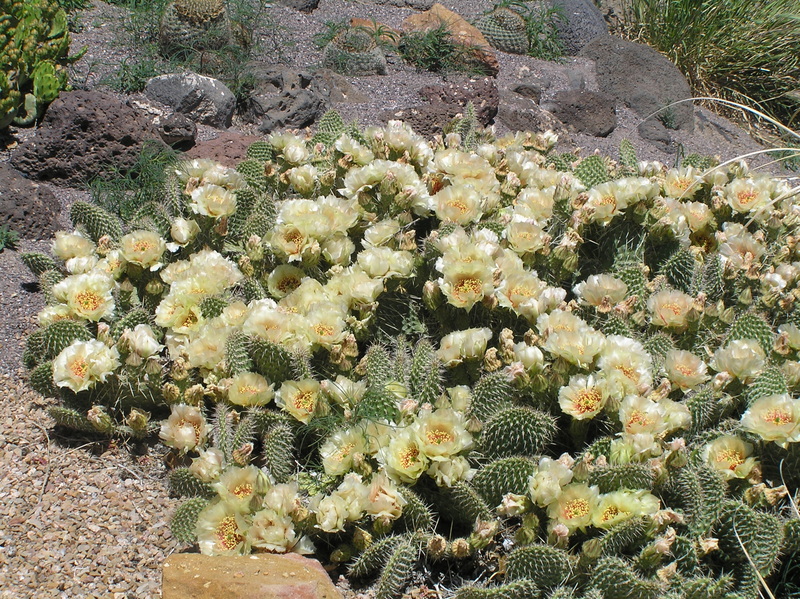 This mounding cactus is covered in long white spines, giving it a grizzled appearance.It has medium sized pads and clear yellow flowers in spring. Our selection comes from southeastern Utah. 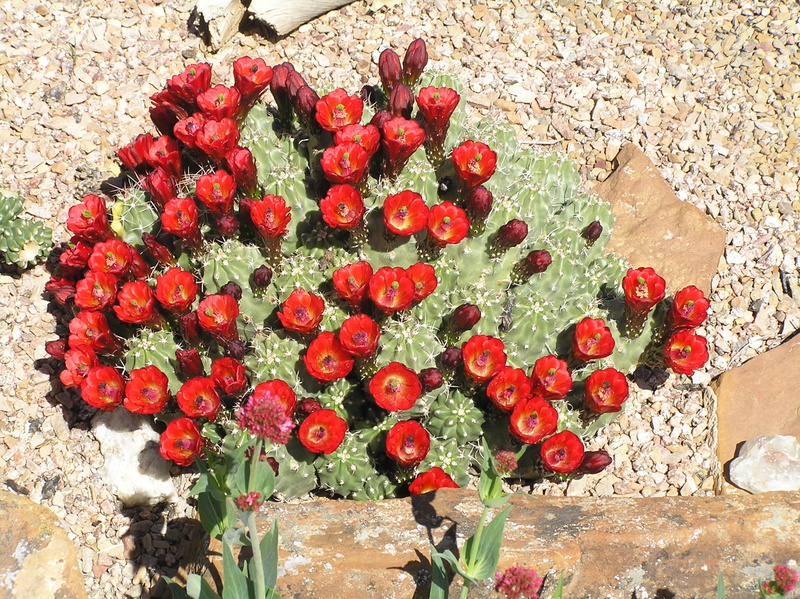 This is a mound forming cacti with semi upright pads and pale red flowers. 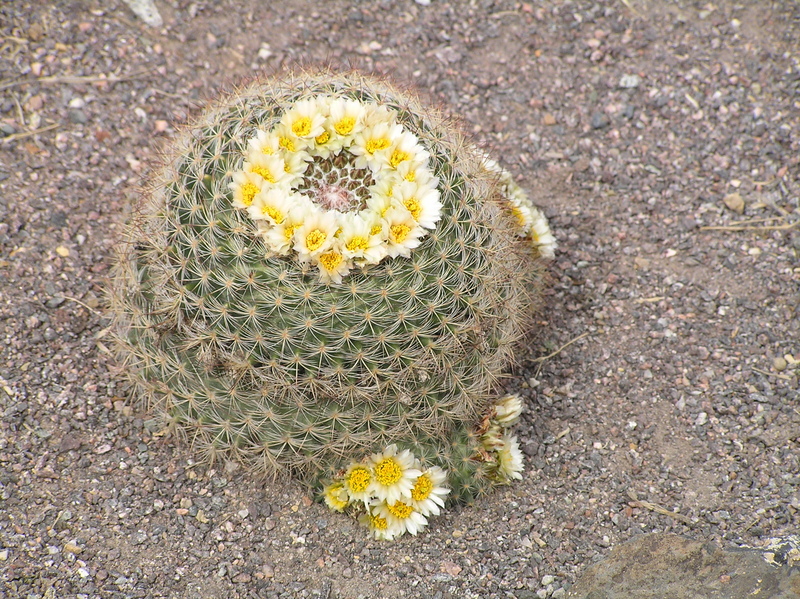 This is a small mound forming ball shaped cacti with white star shaped spines. The flowers are pastel shades of white to pink.